The Dolphins figure to take a closer look at Ballage after they declined to re-sign Frank Gore, Charles Trainor of The Miami Herald reports. Ballage's work ethic and athleticism have made a strong impression on running backs coach Eric Studesville, one of the few holdovers from the old coaching staff in Miami, Barry Jackson of The Miami Herald reports. "[Ballage]'s a big, physical body," Studesville said. "He can run. He's athletic. He's got a lot of growth to do as far as seeing and recognizing things. His work ethic is tremendous. He's got speed for a big man." Ballage rushed 12 times for 47 yards and caught his only target for one yard during Sunday's 42-17 loss to the Bills. Ballage rushed four times for 10 yards and caught two of four targets for 39 yards in Sunday's loss to Jacksonville. Analysis: Ballage didn't come near his Week 15 workload -- one that saw him log 12 carries for 123 yards -- disappointing fantasy managers who risked starting him in their lineups. 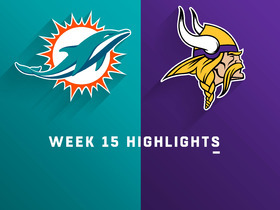 The rookie was mostly stifled alongside the rest of Miami's offense, which managed only 183 total yards on the day. Ballage was able to briefly showcase his receiving chops, averaging 19.5 yards per reception and doing most of his damage after the catch. Ballage is headed for a key role in the Miami backfield with Frank Gore (foot) expected to miss the rest of the season, ESPN.com reports. Ballage carried the ball 12 times for 123 yards and one touchdown during Sunday's 41-17 loss to the Vikings. He also caught one pass for a loss of two yards. Ballage did not play a single offensive snap during Sunday's 34-33 win over the Patriots. Analysis: Ballage's only contributions during the Week 14 victory came in the form of his 19 special teams snaps. The rookie fourth-round pick appeared to have been carving out a niche role in Miami's rushing attack prior to Sunday's silent showing, but his volume projection for the rest of the season is now murky at best. It seems increasingly likely that Ballage won't get much of an opportunity for touches in 2018. Ballage carried the ball four times for just three yards during Sunday's 21-17 win over the Bills. Ballage caught both his targets for a loss of five yards during Sunday's 27-24 loss to the Colts. Analysis: For the second straight week, Ballage saw work in the passing game but did not log a single carry. The rookie fourth-round pick has brought in all five of his targets this season, but he's yet to make a notable difference with his touches despite his 6-foot-2, 237-pound frame. He'll continue to play a depth role in Miami's offense during the Week 13 tilt against the Bills. Ballage brought in his only target for six receiving yards during Sunday's 31-12 loss to the Packers. Analysis: Ballage once again remained relegated to a niche role in Miami's offense. It speaks well of the rookie's pass catching abilities that he saw the field during the Dolphins' first half two-minute drill, but Ballage appears unlikely to carve out a sizeable offensive role this season. The rookie has yet to receive more than 10 offensive snaps in a single game, and he's consequently only worth rostering in dynasty formats. Ballage recorded one carry for a loss of two yards and caught both his targets for 17 yards during Sunday's 13-6 win over the Jets. Analysis: Ballage saw his largest offensive workload of the season during the Week 9 win, logging three touches on four offensive snaps. The rookie running back appears to have carved out a niche offensive role, and he's now showcased his pass-catching skills on an NFL field. 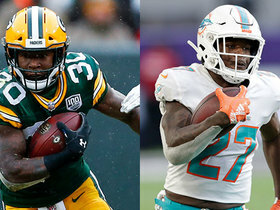 Ballage is unlikely to garner a notable offensive workload this season behind Kenyan Drake and Frank Gore, but he warrants attention in dynasty formats. Ballage recorded a two-yard carry during Sunday's 27-17 loss to the Bengals. Ballage recorded one carry for three yards in the Dolphins' 38-7 loss to New England on Sunday. Analysis: Ballage logged his first NFL carry during Sunday's blowout loss, on what was his only offensive snap. 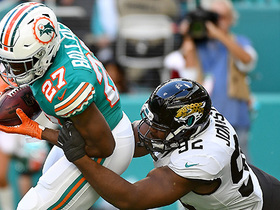 The rookie running back also played 56 percent of Miami's special teams snaps. 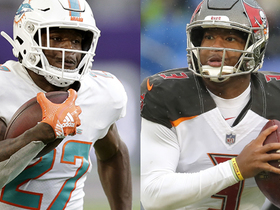 Week 4's game script forced the Dolphins to quickly turn away from the running game, but Ballage seems to be slowly carving out a larger role for himself. Ballage is a healthy inactive for Sunday's game against the Titans, Adam H. Beasley of the Miami Herald reports. Ballage (concussion) took four carries for 25 yards and a touchdown and caught three of four targets for 37 yards in Thursday's preseason finale against Atlanta. Analysis: After missing the previous two games, Ballage got the starting nod Thursday and immediately took advantage of his opportunity on the first two drives of the night. He finishes the preseason with 14 carries for 62 yards (4.4 YPC) and six catches for 60 yards in two games, locking down the No. 3 RB spot behind Kenyan Drake and Frank Gore. It's a role that probably won't entail many touches, if any, during a Week 1 matchup with the Titans. Ballage (concussion) isn't expected to play Saturday against the Ravens. Analysis: Ballage is well into his second week in the concussion protocol, and his inability to practice yet indicates he isn't close to gaining clearance for contact. With Ballage again out of commission, Senorise Perry is set to receive the first backfield reps once Kenyan Drake and Frank Gore are done for the day. Ballage missed Thursday's practice as he continues through the NFL's concussion protocol, Alain Poupart of the Dolphins' official site reports. Analysis: Ballage entered the concussion protocol after last Monday's practice session and his continued absence seems to indicate he could miss a second preseason game. Look for Senorise Perry to see some extra snaps if Ballage is sidelined for Saturday's contest against Baltimore. Ballage remains in the concussion protocol and isn't practicing Tuesday, Armando Salguero of the Miami Herald reports. Analysis: The rookie fourth-round pick missed last week's preseason game in Carolina and isn't looking good for Saturday's exhibition against the Ravens. His absence isn't a huge concern in terms of Miami's Week 1 gameplan, considering Ballage is expected to start his career third or fourth on the backfield depth chart. If the concussion symptoms linger, Senorise Perry would see his roster odds improve. Ballage (concussion) won't play Friday against the Panthers, the Miami Herald reports. 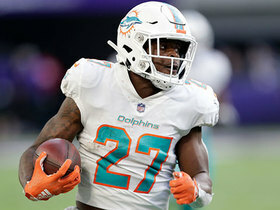 Analysis: With Frank Gore being rested, Kenyan Drake will start at running back for the Dolphins on Friday, but expect his healthy backups to see plenty of touches once he gets some initial reps.
Ballage has entered the concussion protocol and isn't taking part in Tuesday's practice, Barry Jackson of the Miami Herald reports. Ballage opened the preseason with 10 rushes for 37 yards and and three catches for 23 yards in Thursday's 26-24 loss against the Buccaneers. Analysis: Ballage also lost a fumble while attempting to hurdle a defender, kneeing the ball out of his own hands. That rookie mistake aside, the 2018 fourth-rounder ran acceptably between the tackles and showed well as a pass catcher. Ballage is a lock for the No. 3 running back spot as of now, but remains firmly behind Kenyan Drake and Frank Gore. 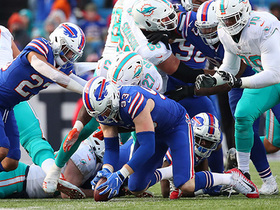 Miami Dolphins wildcat play ends in a fumble recovery from Buffalo Bills defensive end Trent Murphy. 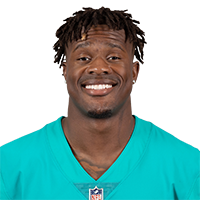 Miami Dolphins quarterback Ryan Tannehill tosses a short pass to running back Kalen Ballage who picks up 31 yards. 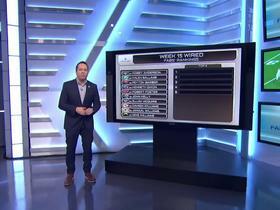 "NFL Fantasy Live" crew present "The Colonel's Corner" where they read tweets from viewers in and help them choose who to play for Week 16. 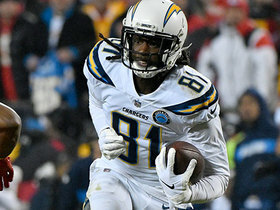 The "NFL Fantasy Live" crew break down what waiver wire additions can win you your fantasy football championship. Check out the fantasy performances that helped no one in Week 15. NFL Network's Matt "Money" Smith and Maurice Jones-Drew discuss which surprise performers fromWeek 15 are legit and which are not moving forward. NFL Network's Michael Fabiano highlights his top five waiver targets for Week 16. 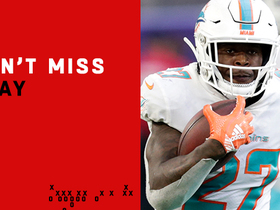 Miami Dolphins running back Kalen Ballage uses speed to weave through defenders on 75-yard run.